A superb George III Pine Settle in wonderful original condition, having a high panelled back with curved arms raised on turned supports. The seat with a concealed lift up lid which opens to reveal a large storage well underneath the seat. The front and sides also decoratively panelled, the whole raised on stile feet. 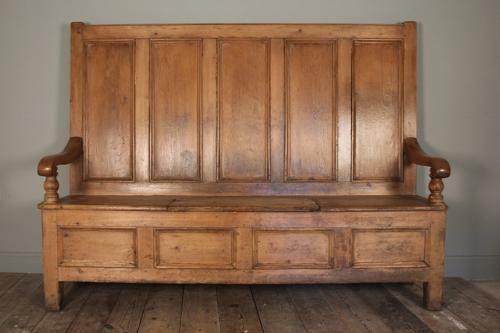 Excellent colour with fabulous wear and patination to this characterful Settle. Strong and firm standing. Welsh, George III.